The Safeway supermarket brand is to disappear from the UK by the end of this week, when Morrisons completes its 20-month conversion programme. 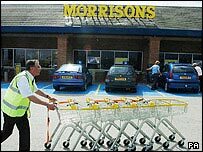 Morrisons, which bought Safeway for £3bn in March 2004, will on Thursday open the doors at the last four stores to have their livery changed. Of the 479 Safeway shops, Morrisons has now converted more than 200, with most of the remainder sold off to rivals. The few Safeway stores not being sold or converted will close on Saturday. The move consigns the Safeway name to history 43 years after it opened its first supermarket. The only remaining temporary reminder will be a few delivery lorries that will continue to bear the logo for a while longer. Morrisons chief executive Bob Stott said the completion of the conversion was a "significant landmark" in the history of Morrisons. The group has had a difficult time in recent months, with the task of combining the two businesses leading to several profit warnings. Last month Morrisons posted the first loss in its 106-year history, as a result of the heavy costs incurred from integrating Safeway. 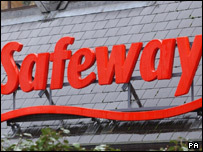 Morrisons was forced to sell many of Safeway's stores to comply with anti-monopoly rules.